Michele Bachmann's new book has been on shelves for two weeks now, and that's apparently where it's staying, says a report. "Core of Conviction" is a 224-page memoir and political manifesto, filled with half-truths and 109 exclamation points. 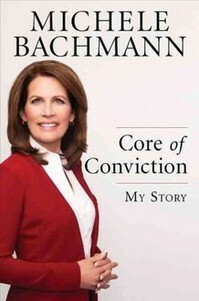 Bachmann's been on a book tour since its release before Black Friday. On Amazon.com's "Best Sellers in Politics" list, "Core of Conviction" ranked 96th.Incidentally, the book was outpaced by Jesse Ventura's latest, which came in at 91st.